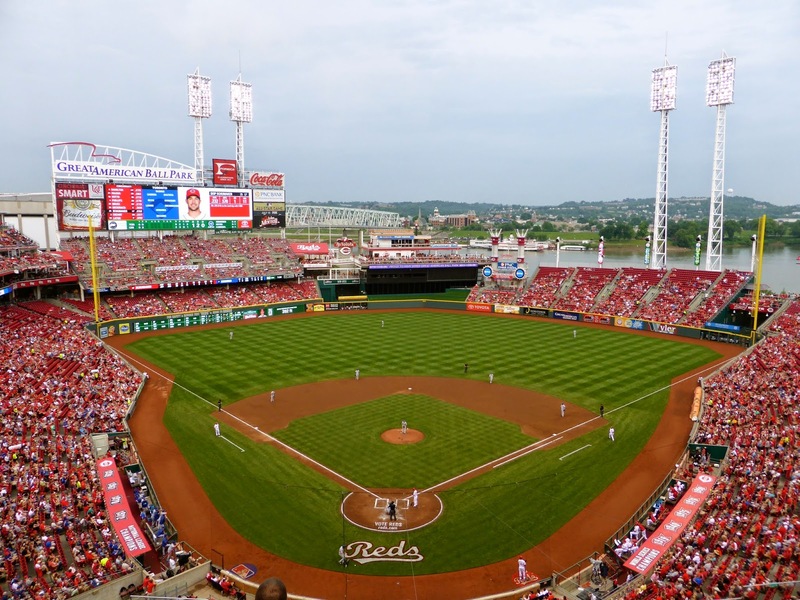 My last visit to Cincinnati for baseball was in 2003, when Great American Ballpark opened. 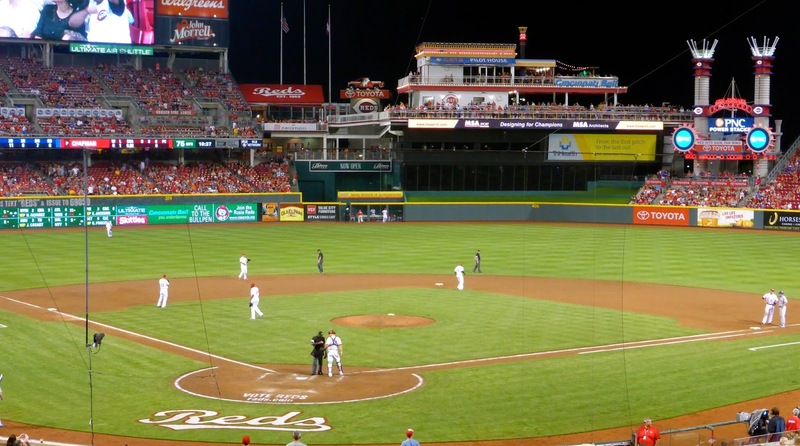 For those who think the town is bragging about their stadium, the name is due to corporate sponsor Great American Insurance, although the ballpark is pretty nice too. 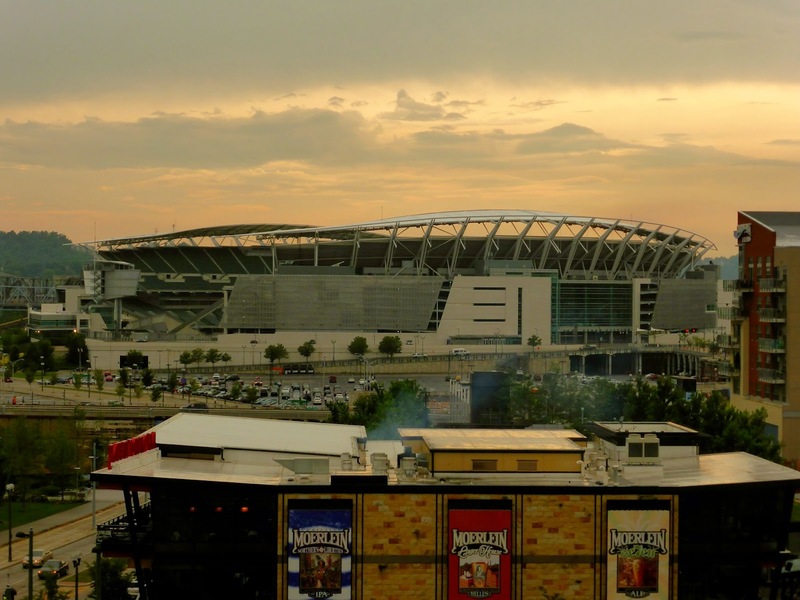 The area around it, which was still undergoing renovations a decade ago, has developed into one of the prime downtown stadium destinations, with Paul Brown Stadium just a few blocks away (below). My friend Sharpy joined for the weekend and we arrived on Friday morning, checking into our hotel in Newport, Kentucky. 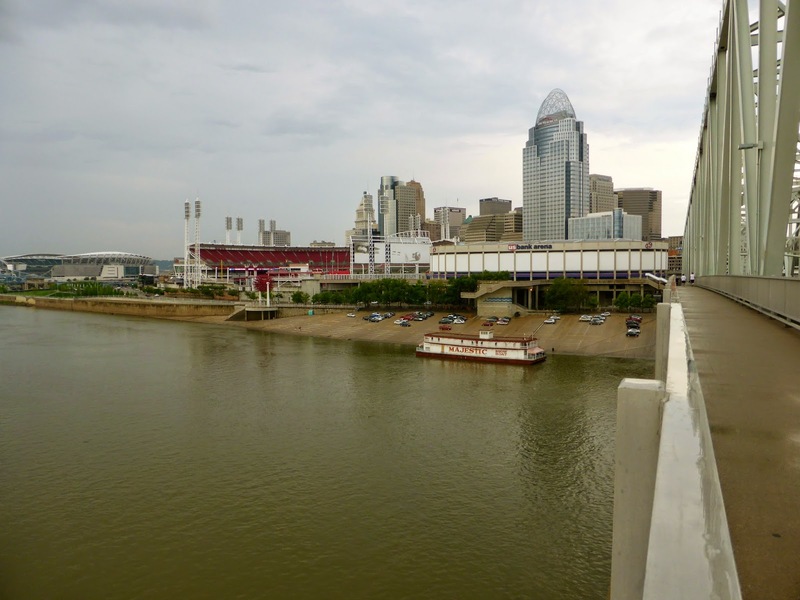 Whenever I'm in Cincinnati, I stay south of the river as Kentucky is usually a bit cheaper and you can walk across one of the bridges to the stadiums. Newport is also home to a number of bars, including Brothers Bar and Grill on the Levee, a great spot for watching the World Cup. After checking out the early game there (where Costa Rica upset Italy 1-0) we headed over the river to GABP and watched France dismantle Switzerland at the Holy Grail, a bar just across the street from the ballpark. 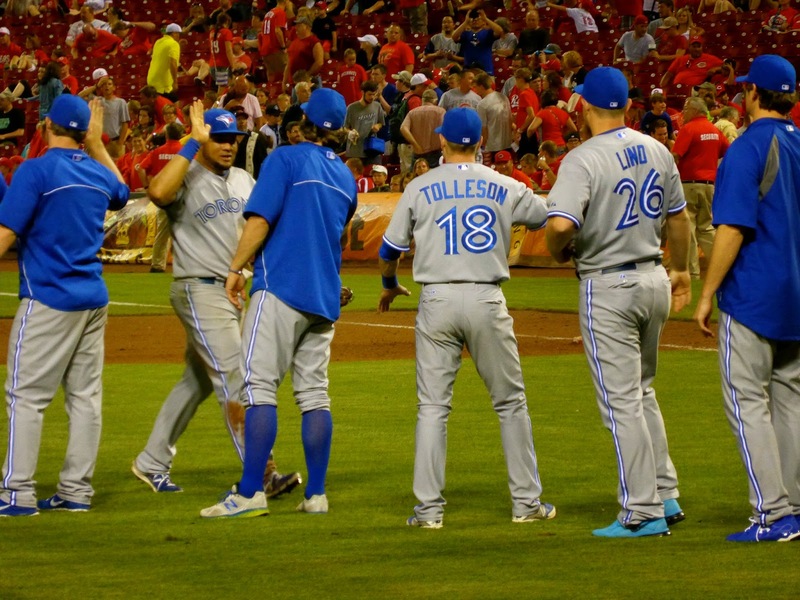 There were many other Blue Jay fans partying here, part of a large contingent down for this rare interleague matchup, only the third time that Toronto has played in Cincinnati. As gates opened, we headed over to have our StubHub tickets printed, only to find out that there is no need for that here, they can scan you in via the ticket on our phone. Unfortunately, this leaves you without a collectible stub, but such is life these days. If you are lucky, you can get one from a fan who doesn't collect them or find one on the ground, but if not, you'll have to print out the StubHub ticket later. 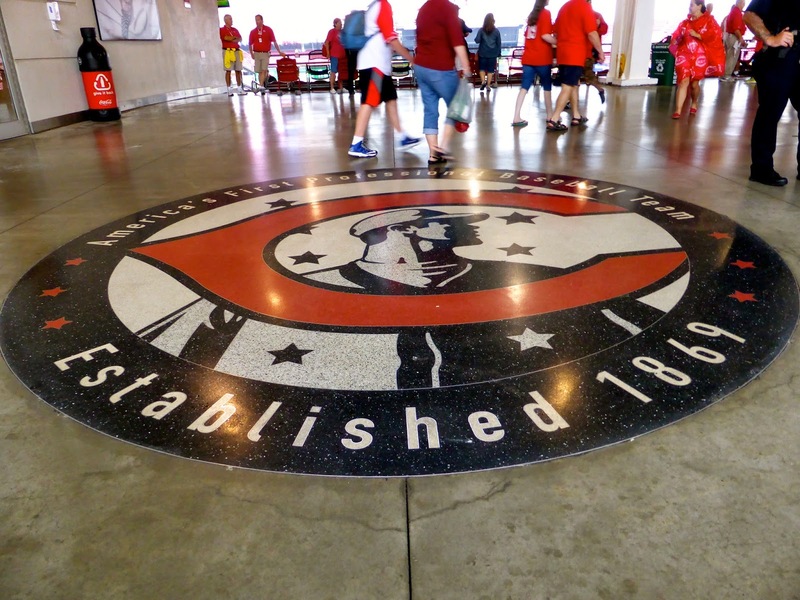 Before entering, you should check out the monument in front of the main entrance that highlights Crosley Park's famous left-field terrace, where bronze statues of Crosley-era stars Joe Nuxhall, Ernie Lombardi, Ted Kluszewski, and Frank Robinson are playing an imaginary ballgame. The Reds Hall of Fame and Museum is here as well, and costs $10 to visit. It is the largest team HOF in the nation, not surprising given the history of this franchise. 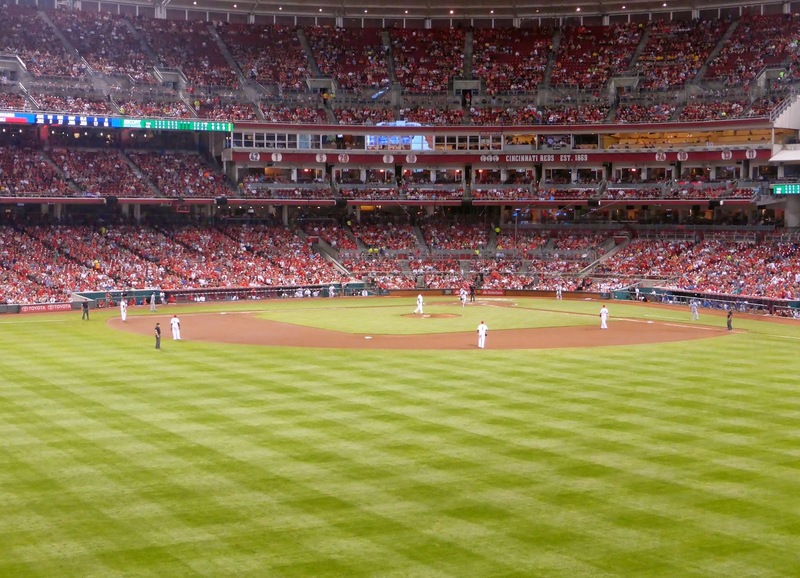 The Great American Ballpark is quite impressive despite a relatively small capacity of 42,319. It took well over an hour to walk around the lower and upper concourses taking everything in. There are a number of features here, including the Power Stacks (right on the photo below), two smokestacks in right center field that spew flames and launch fireworks when something good happens to the Reds. The seven baseball bats featured on both smokestacks symbolize Pete Rose's 14, which cannot be displayed in numerical format due to Major League Baseball restrictions. There are many other touches scattered around, so take your time and try to find everything. The seats in the upper deck behind the plate offer views of the river and Newport and are a good spot to see the game as well. There are a number of standing spots around the ballpark which we explored during the game. One thing to note is that the franchise says it was established in 1869; this is not quite true. Pro ball did begin here in that year, but the Cincinnati Red Stockings were dissolved in 1870, while the Reds did not begin play until 1882. It is a small distinction but one worth understanding. 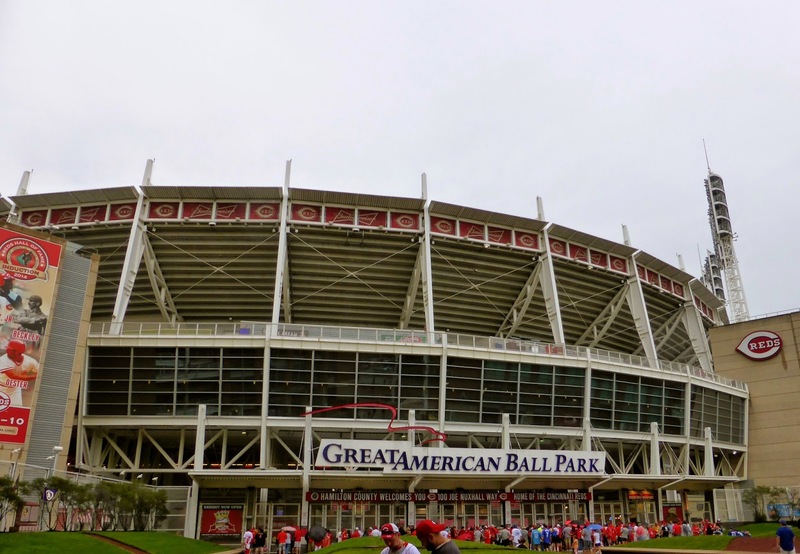 Overall, GABP is deserving of its name. Friendly staff who don't check tickets even low down, some cheap food options including $1 hot dogs and sodas, and nods to local culture as well as the franchise's past greats make a visit here very enjoyable. It helps when your team wins a historic game. The Friday night matchup saw spot starter Liam Hendriks, called up from Buffalo to replace R.A. Dickey, who had his start pushed to Sunday due to a sore groin. 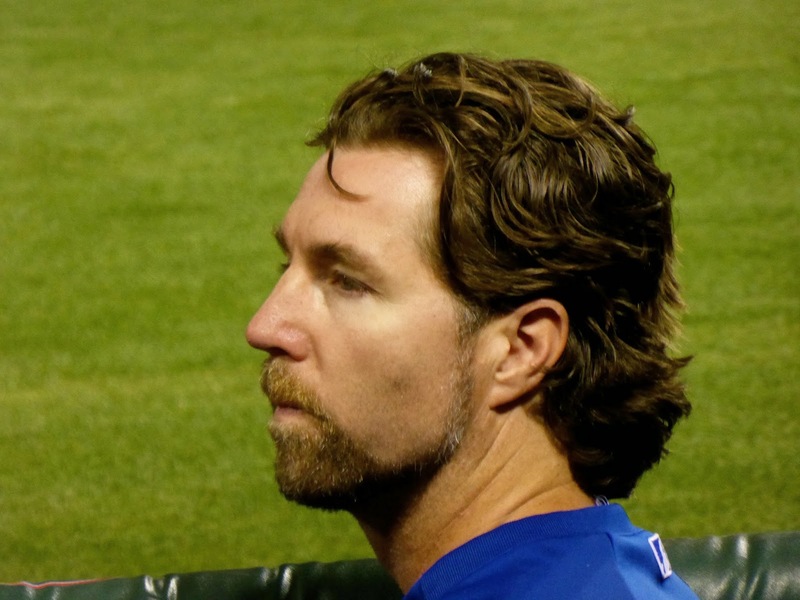 Hendriks had pitched well in a previous appearance with the Jays, but that was not the case this time, as he was pummelled for 6 runs in 1.2 innings. Todd Redmond came in and gave up another couple of runs and it was 8-0 Reds after two. 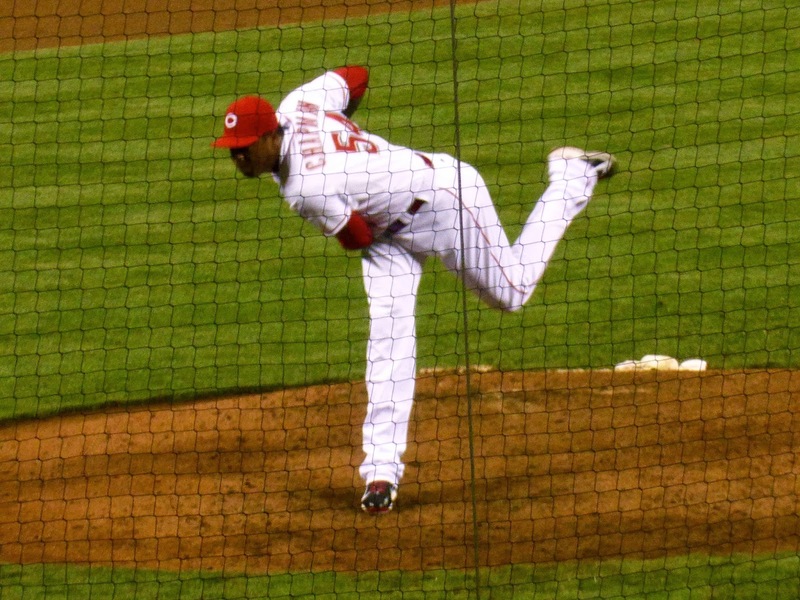 Edwin Encarnacion mashed a 3-run bomb in the third to give the Jays some hope, but the Reds added another on an Encarnacion throwing error in the fifth. So with 12 outs left, the Jays were down 9-3. Sharpy and I began to tour the ballpark around now, stopping behind first base as the Jays added a couple in the 6th including a bases-loaded walk to Jose Bautista. In the 7th we moved to beyond center field, and watched Brett Lawrie and pinch hitter Juan Francisco hit homers that brought the Jays to within a run. Sensing that our wanderings were good luck, we continued, standing behind home plate for the 8th, in which Dioner Navarro doubled home Encarnacion to tie the game! In the ninth, we moved down to the seats behind the Jays dugout and watched as Erik Kratz doubled off Aroldis Champman (above) to score Colby Rasmus and give the Jays the incredibly surprising lead. Melky Cabrera singled home Kratz and a few batters later, Encarnacion hit his second 3-run shot of the evening to make it 14-9. 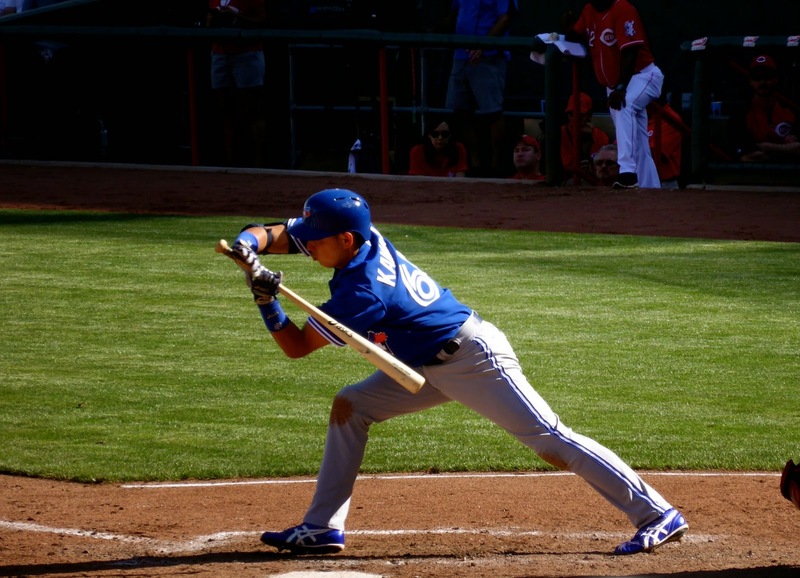 Casey Janssen retired all 3 hitters he faced, including Joey Votto (above) to preserve the miracle comeback, the best Jays game I have seen on the road ever. Seeing your team on the road is tough, as they generally win less than half their games, so when something like this happens, it makes it all worthwhile. This was the second largest comeback in franchise history (they beat Boston in extra innings in 1989 after falling behind 10-0) and a great way to start the trip. Sadly, the next two days were to be the opposite. 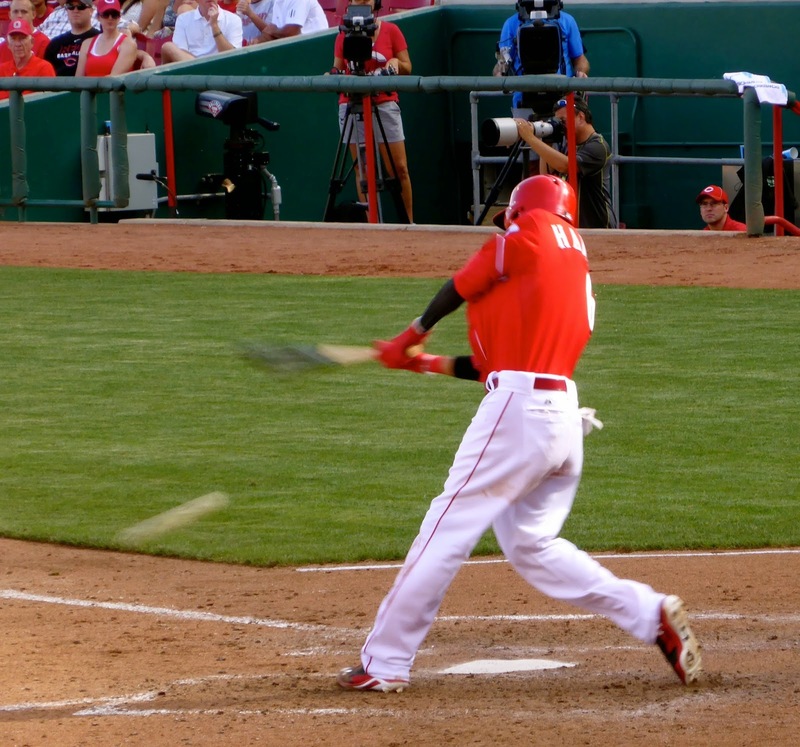 Through StubHub, we got good seats for both games, but the investment did not pay off, although I got some good shots such as the one of Billy Hamilton below. J.A. Happ pitched Saturday, when the team absolutely needed a gutsy performance, but he walked four in the first frame and ended up leaving after 4 innings, with the team down 8-0 yet again. There would be no comeback this time though, Mike Leake threw 8 strong innings for the Reds who won 11-1. 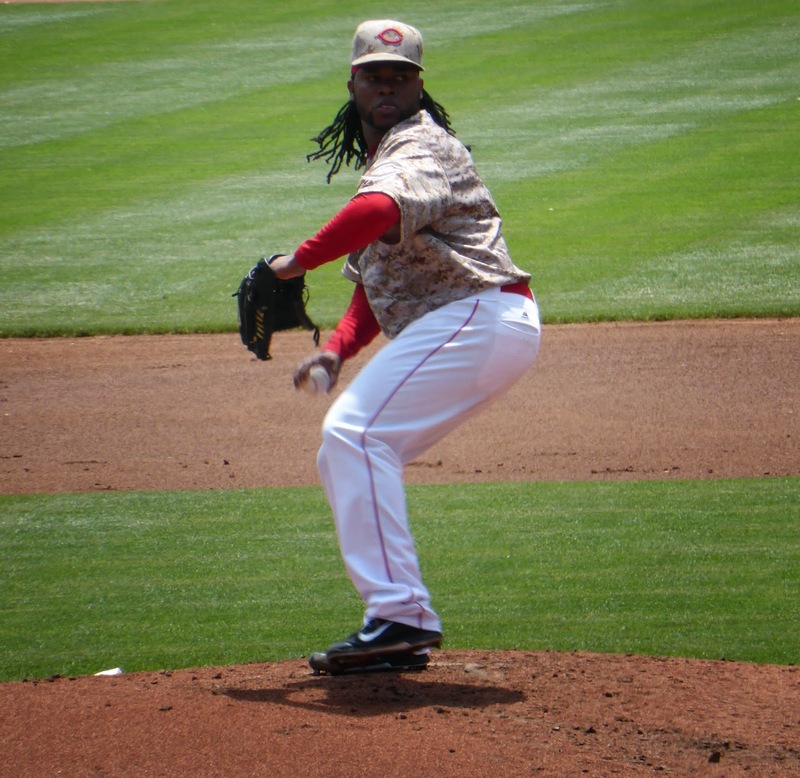 On Sunday, the Reds wore their camouflage uniforms and had Johnny Cueto, the league's ERA leader (above), starting against Dickey (below). It was stifling hot which made what should have been a great day into one that ended up being rather forgettable. 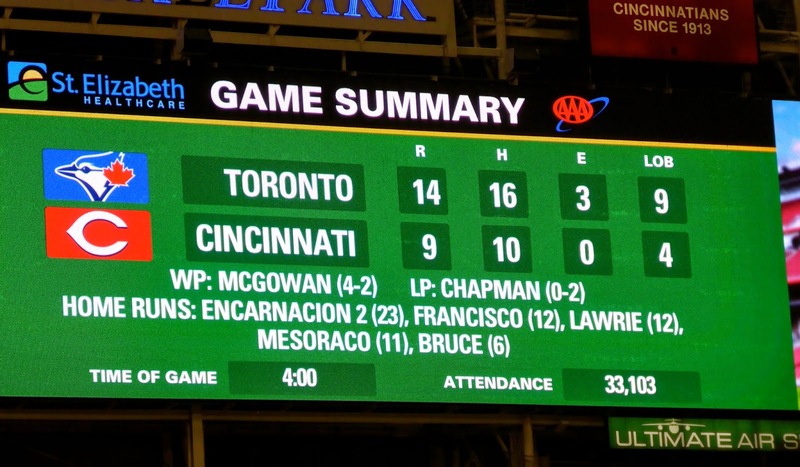 A first-inning dropped throw by Encarnacion lead to an unearned run, and although Toronto scored a couple of their own when the Reds made two errors in the third, Dickey was unable to hold the slim lead, with a 2-run homer by Todd Frazier giving the Reds a 4-2 lead. 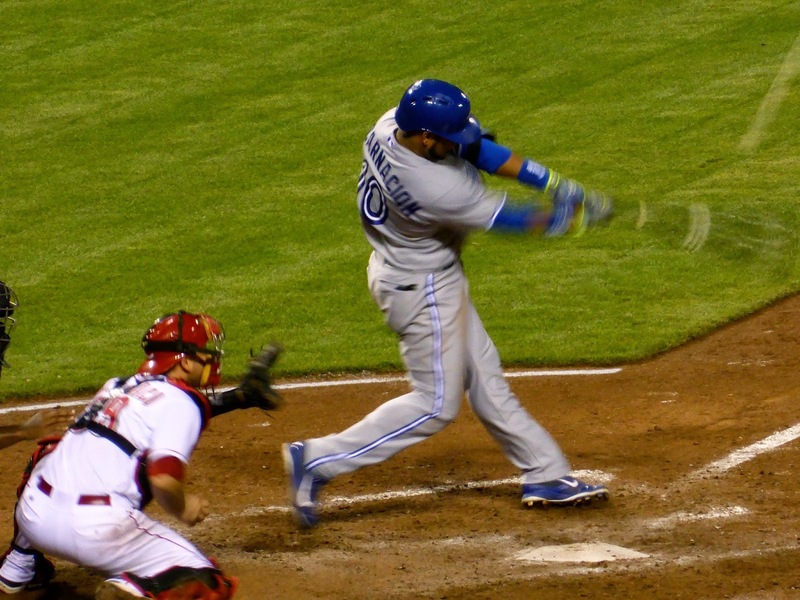 Encarnacion added a solo shot in the 8th to make it close, by Chapman struck out all three Jays in the ninth, including woefully overmatched Masanori Kawasaki (below) to end things and the Reds recovered for their Friday collapse to take two of three and send us home depressed. During Friday's game, Sharpy and I had the pleasure of meeting Tim Parks, founder of the MLB Ballpark Pass-Port program. Yes, his name is Parks, perfect for this business. 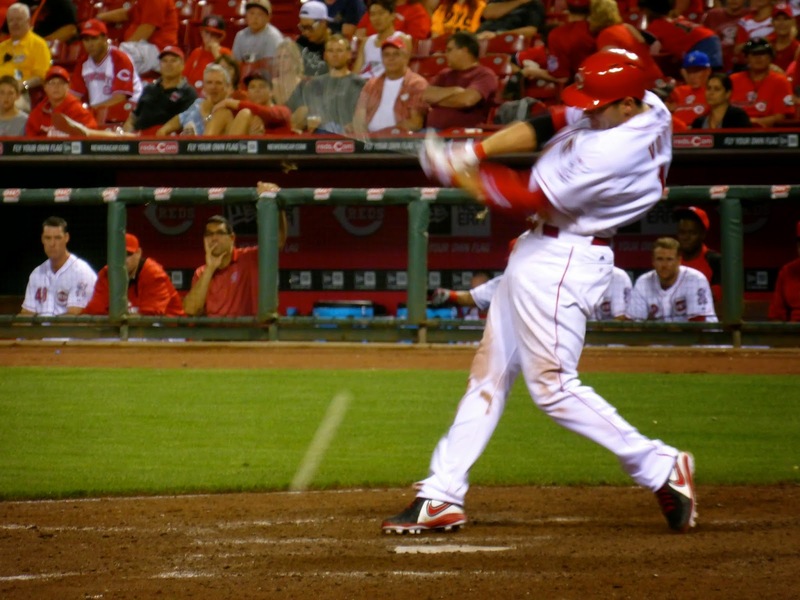 The program offers two books, one that includes information on every MLB Ballpark and is perfect for the road tripper who intends to see all 30. The program is licensed by MLB and when you visit each stadium, you can stop by guest services and stamp your book with an official stamp much like a real passport. Smaller books allow you to track 25 games regardless of stadium and are $17.95, while the larger books are $59.95 on his website. A minor league version is also available although some clubs have yet to sign up for the program. Saturday saw Ken Griffey Jr. bobbleheads given away to the first 25,000 fans. The bobblehead commemorates The Kid's 500th home run. Some fans of the sold out crowd did not receive one, coming too late, but that didn't stop them from using devious methods to acquire a couple. In front of us sat a family of four, with two young children. Around the third inning, they suddenly got up and left, a curious act. A few minutes later, their seat neighbours returned from a trip to the concession stand and asked us if we had see their bobbleheads. Nope, but it soon became clear that the family had seen the giveaway items lying under the chairs adjacent and used the opportunity to pick up a couple of free birthday presents for their kids. Amazing what people will stoop to for something with absolutely no intrinsic value, which can be bought on eBay for $20. My Blue Jays road record is 21-20, counting only the series where I first visit the venue.